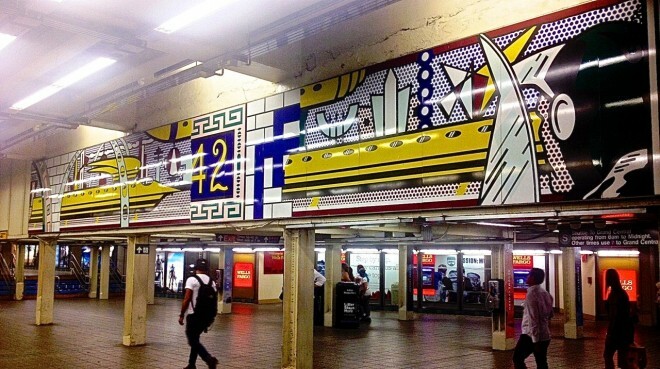 The NYC subways are an incredible depository of original art work by know and emerging artists. A few weeks ago we followed the Q line along the new 2ND Avenue stations. This week we will be travels to various stations to sketch the works of Lichetenstein, Wegman and Otterness, among others. Time and logistics will determine how many stops we can make. The group can decide to continue to work only in this station or to move on. William Wegman: Our next stop will be the new installation by Willian Wegman at the 23rd Street Station on theM and F line. Here is an article about the installation: https://www.citylab.com/design/2018/12/william-wegman-weimaraner-dogs-subway-art-new-york/578161/. Tom Otterness: If time and circumstance allow we will then go to the 14th Street 8th Avenue station to see the Tom Otterness creatures. Here is an article about the installation "Life Underground". http://www.tomostudio.com/artworks/life-underground. MEETING LOCATION: TIMES SQURE STATION BY THE LICHENSTIEN MURAL. PLEASE NOTE: this is going to be a challenging sketch crawl. We will be underground and not have access to food concessions. Drawing in some locations will be tight because we will be on the train platforms. Please be prepared for this. Bring a stool, water and food. There will be bathrooms at some stations and you have the option of going out and coming back as you wish, of course with an additional fare. TRANSPORTATION: ANY SUBWAY THAT WILL STOP IN TIMES SQUARE. Please RSVP directly to Raylie Dunkel at raylie@verizon.net. If you RSVP we will know to look for you. Looking for us? You can try texting/calling Raylie at 201-978-6387 but service underground is limited. Note that we will be at the Times Square station for at least two hours and then move on to the next two stops for about one hour each.